Upper: Spacer mesh, TPU welds, synthetic leather. 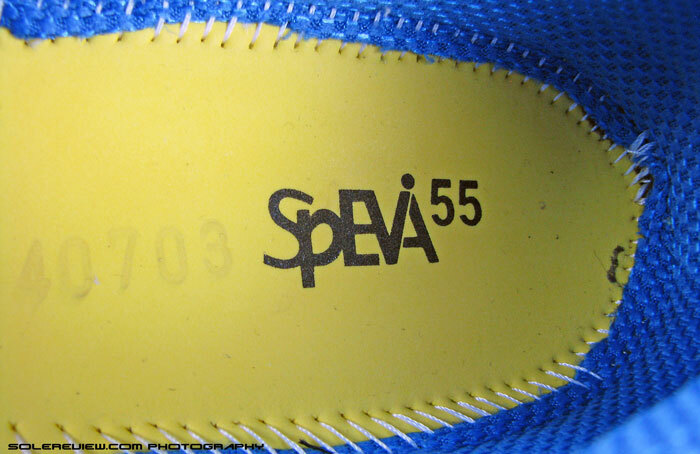 Midsole: Tri-density EVA foam with heel(visible) and forefoot (internal) Gel pads. Firmer foam insert on inner side. Midfoot plastic shank. 10mm heel drop. 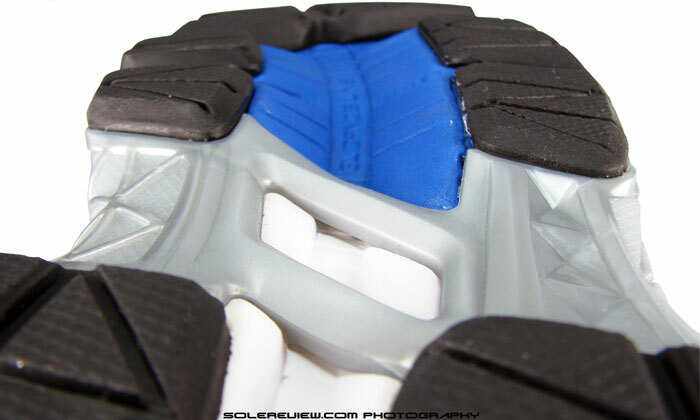 Outsole: Heel carbon rubber, blown forefoot rubber. Widths available: D-standard (reviewed), 2E(Wide) and 4E(Extra wide) in select colors. The new GT 1000 hasn't changed much in character, but comes with some cosmetic improvements. Ride is still firm, and the upper gets snugger due to an additional layer of upper lining. Annual update of the Kayano and GT-1000 is complete. Next-in-line GT 2000 refresh will complete the loop. The annual refresh of Asics’ bread and butter Triumvirate (Kayano, GT 2000 and 1000) is now two-thirds complete, with the new GT-2000 3 release due in November. Earlier last month, the Kayano 21 decided to embrace an increased level of midsole softness, altering its character (and potentially, its target customer) in the process. So where does that leave the GT-1000 3? 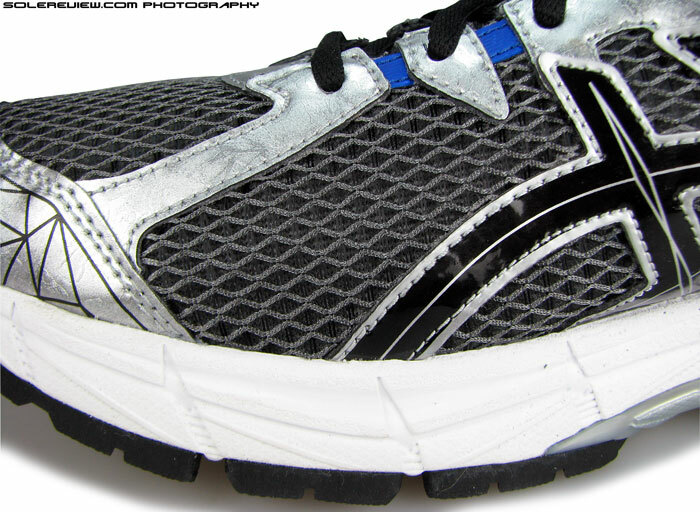 Does it align with the new personality U-turn seen on the new Kayano? No such thing happens. Masters of incremental evolution they are, Asics decides to keep the GT true to its earlier self, by which we mean a pronation control shoe with a firm ride. Asics calls out that now the shoe comes equipped with IGS (Impact Guidance System) which ‘elevates it to a new echelon of technical performance’ , but honestly, that’s a marketing hyperbole which translates into little of substantial value. Nevertheless, there are changes. There are a couple which can definitely be seen as improvements. And there’s one which could be favorable or undesirable, depending on what your needs are. These updates are similar to the ones witnessed in the new Kayano, albeit of a lower magnitude. The last generation GT 1000 wasn’t impressive from a material standpoint, its upper emitting a literal stink. The shoe actually smelled of acrid, industrial compounds, an odor more at home inside a can of bug spray than in a running shoe. Thankfully, that isn’t the case in the 2014 refresh. We have a sneaking suspicion that the 2013 GT 1000 2 used materials other than polyurethane for welding parts of its upper, which could have led to the pungent smell. Now that we don’t need the older GT, we’ll do a PVC burn test later this month and see if our hypothesis holds any water. We could be wrong in our assumption, but no harm in trying to find out if Asics actually used PVC in the GT 1000 2. Mercifully, the synthetic leather texture on the new GT looks far more premium compared to 2013. Yes, the spacer mesh too. Feels better. Upper aesthetics also sees a shift towards the better as the new GT-1000 3 employs the use of a different mesh and leather material. 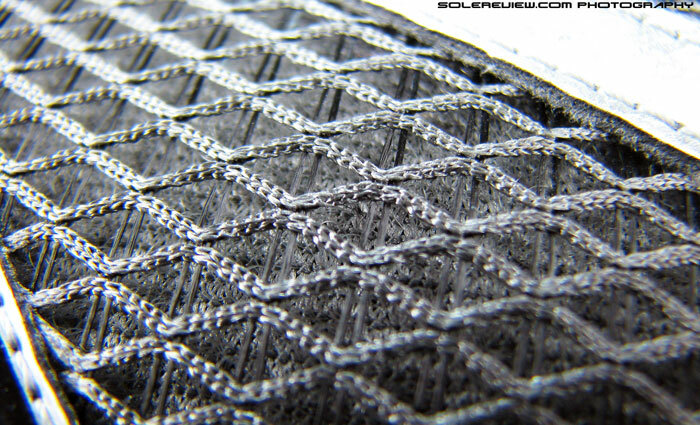 The spacer mesh this time has a less raspy texture and looks much more premium. Same goes for the new synthetic leather used as overlays. Before expanding on the details, a quick primer on footwear materials. Most athletic footwear feature synthetic leather made of two layers. The upper layer is called a ‘release paper’ in footwear development parlance, and happens to be this thin layer which forms the surface texture. The bottom part is called the ‘substrate’, which is a dense fibrous base over which the release paper sits. At the start of every shoe’s development stage, the footwear developer(s) in charge of the project will get to choose the release paper texture, based on the available budget. A series of leather textures will be available for the same substrate base, and prices could differ based on the choice of design. Why are we talking about this? Because the 2014 GT-1000 3 uses a release paper texture which looks and feels more expensive than last year’s. The surface has a nice sheen with a distressed whorl design which appears miles better than GT-1000 2’s gaudy brushed aluminium design. As we mentioned earlier, the mesh also takes a turn for the better, resulting in a better hand feel and general aesthetic. Both of these updates are merely cosmetic, and do not influence the upper fit. The latter sees a change in behavior, but due to a few structural updates. 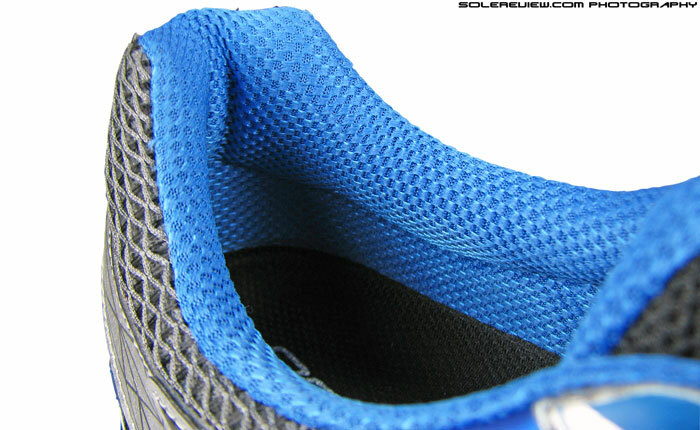 Medial (arch) side of upper has unlined mesh. Whereas the lateral side (right picture) has a second layer of inner lining. Makes the fit snugger. Firstly, taking a cue from the new Kayano, the GT-1000 3 introduces a layer of lining inside the upper. 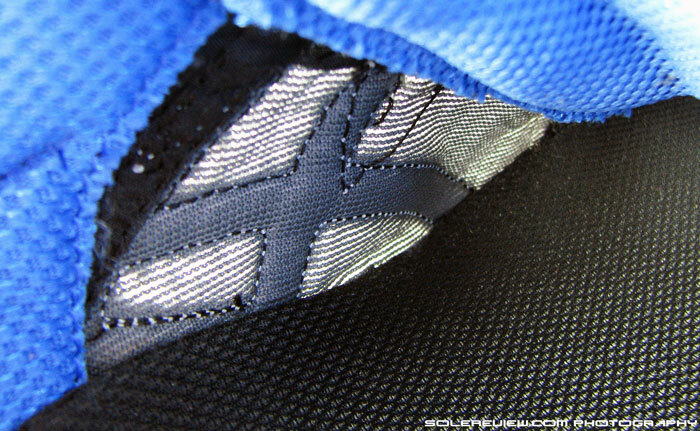 This fabric liner is identical to the one seen on the Kayano 21, except for one difference. In the GT, the lining is used only on the lateral (outer) part of the upper. The medial side remains as is, with no lining. Nevertheless, this has a bearing on fit, with the freshly minted GT-3 coming across as a mite snugger over the small toe. As if to compensate for the lining, synthetic leather overlays have been moved slightly forward and up on the toe box, creating a bigger mesh window on either sides of the forefoot. Despite that, the GT-1000 3 still feels more snugger than 1000-2 for the same D width. 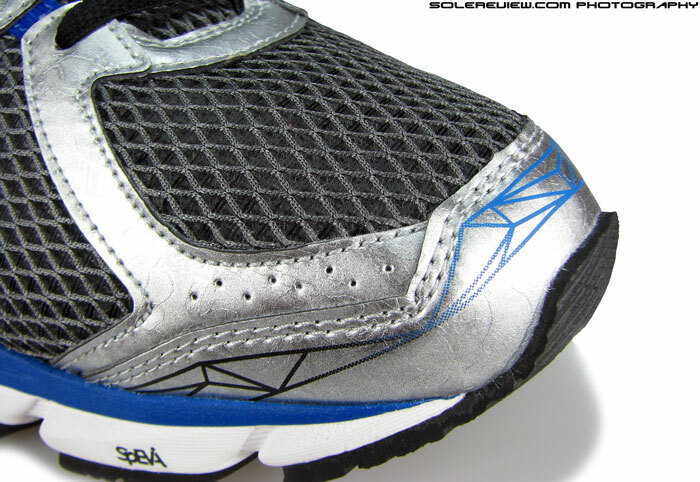 Solace comes for those who require a wider upper fit, as optional sideways sizes (2E, 4E) are available in the GT. Heel to toe length runs true, nothing new to report there. Achilles dip has a slight inwards curve, which helps in a better grip. 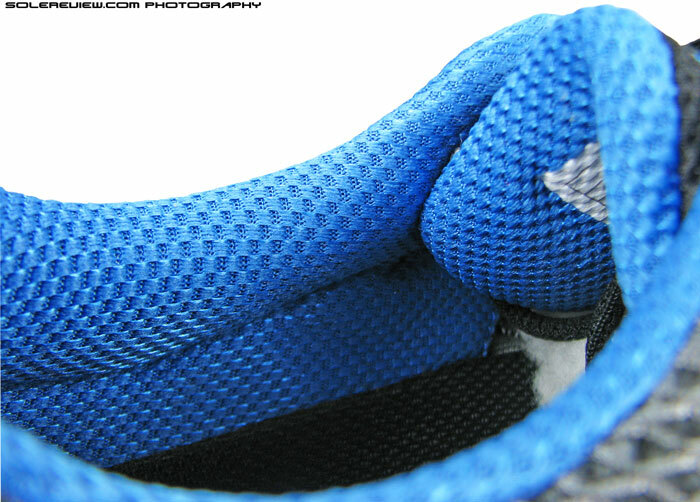 The sense of a narrower fit isn’t restricted to just the forefoot area; lacing pressure on tongue top is stronger too. The gap between each opposing eyelet has been reduced, causing the intersecting laces to create top down pressure to be higher than GT 1000 2. The upper on the previous GT featured a wider lacing breadth, thus spreading the cinching forces over a larger area. 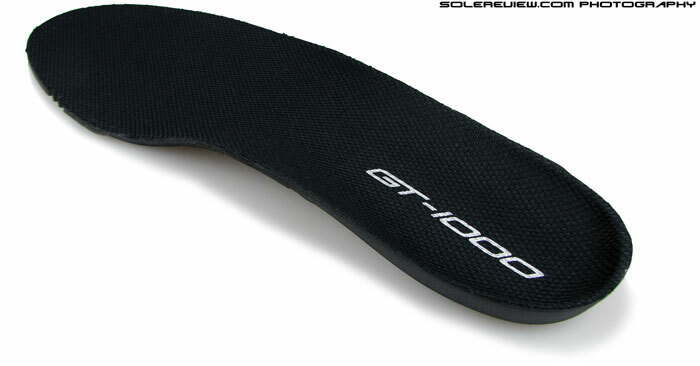 The grip at Achilles point is greater too – the heel counter of GT-1000 3 curves relatively inwards at the top. The collar and tongue lining sees use of the same carryover mesh, so overall feel remains unaltered. The upper has an internal heel counter which lends solidity to rear-foot structure, and a solitary element of reflectivity is welded on. Nicely done too, there’s a ‘3’ numeral printed inset, alluding to the third iteration of the GT-1000. Laces are tonal this year, with a softer hand feel. Laces have been changed to a single tone type, and they happen to be softer too, with none of the tortuous twisting of the GT 1000 2. Good call to swap them out, certainly an advancement over what used to be. There are industry buzzwords like ‘re-engineered’ thrown into the GT 1000 3’s description on the Asics website, but the practical, real world output doesn’t amount to much. 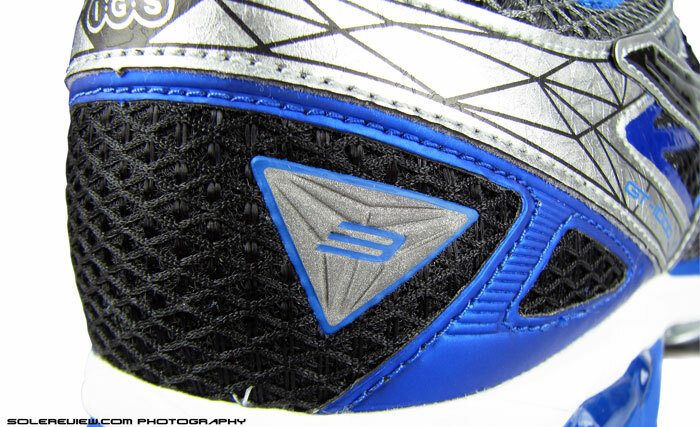 The new GT continues to feature a tri-density construction in its midsole. 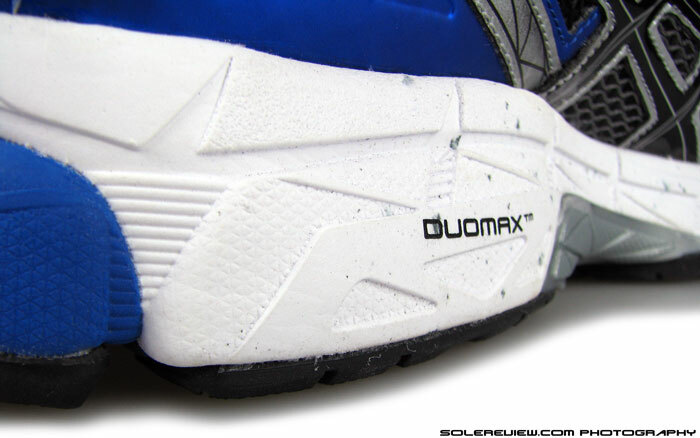 There’s a crash pad on lateral side (blue), with an integrated firm Duomax foam on the arch side – placed with the goal of controlling pronation. 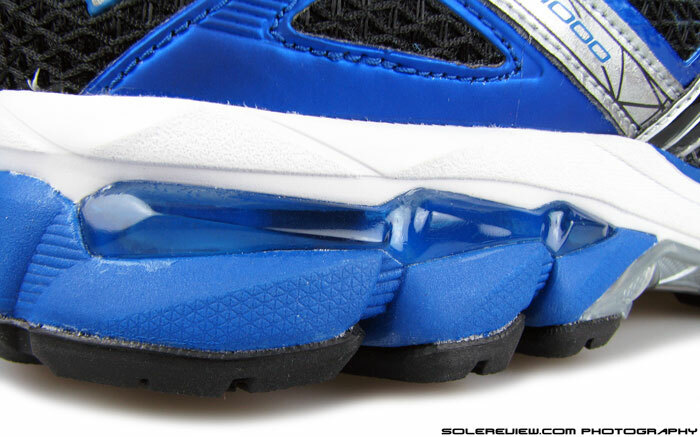 A main midsole foam binds these two densities together, with heel Gel units visible on outer rear-foot. 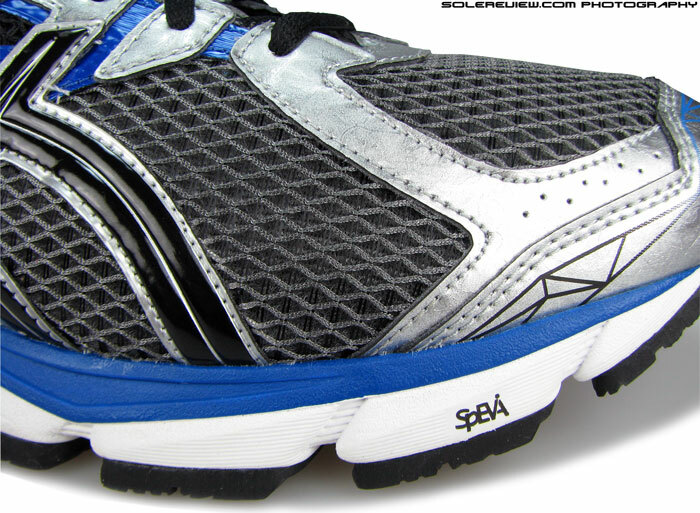 The forefoot has internal Gel pads, and continues to offer a mild level of cushioning, delivering a firm ride. The forefoot is stiff, a tad more than GT-1000 2. The 2012 GT had a firm forefoot, but flexed better right under the metatarsal heads. The new GT in comparison, takes more effort to bend. Heel crash pad is redesigned. It’s now a bigger semi-circular piece, offering improved articulation. Heel and rear foot strikers will experience a greater level of cushioning feel, with the crash pad undergoing a redesign. The area is now shaped like a semi-circle, evolving from the pizza slice-esque geometry from a year ago. This means better articulation, which logically leads to increased flexing of the crash pad during landings. 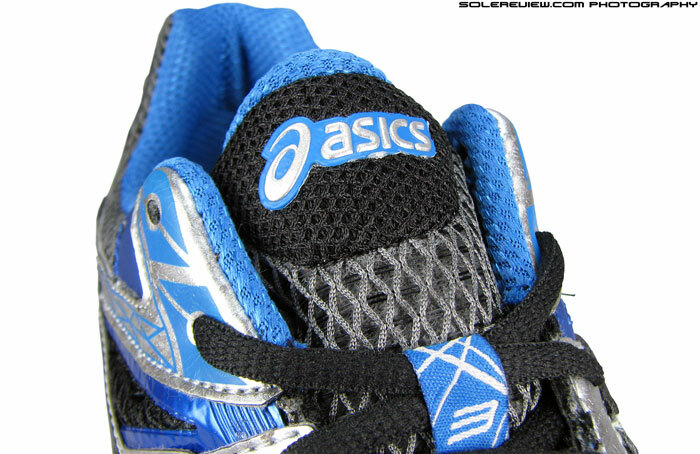 Consequently, the ‘breakaway’ effect leads to a heightened cushioning feel. Otherwise there’s no change in foam density we can point out, with parts like the EVA strobel and molded insole staying the same. Regardless of the marginally increased cushioning, the GT-1000 3 remains a running shoe with a firm ride, this is no Kayano. Good in a way though; as this differentiates the GT from others in the pack. And as the case with most Gel based shoes, the ride isn’t responsive. There’s a gap between the plastic shank and midsole. What for? Not sure, really. Assumption is improved transition. The midfoot shank also sits a bit higher in relation to the midsole. Look closely, and there’s some space between the plastic and foam. This was also seen in the Kayano 21, and we’ll say the same thing which we called out in the Kayano review – no additional change in ride could be felt. The arch support is ok on the GT; the upper doesn’t contribute to much in that aspect, and there’s no hug coming from the midsole either. Outsole durability is decent on the GT 1000 3. The sheet of rubber is thick, and should be able to withstand a high mileage of running over time. Like the case has been for the past versions, the forefoot has blown rubber and rear-foot has hard AHAR compound. 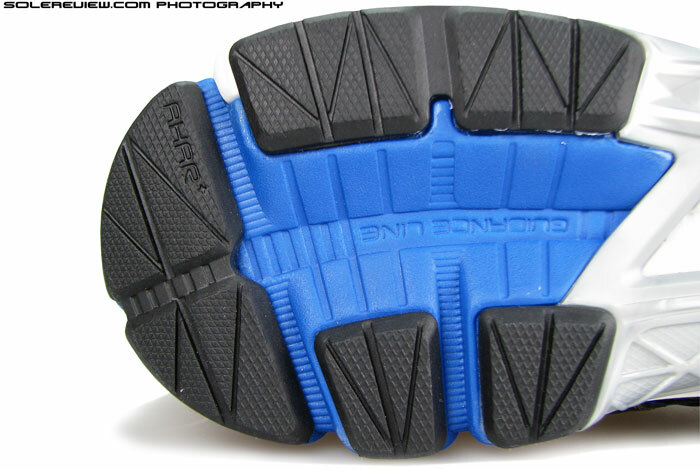 The forefoot grip is better than heel, as the softer rubber offers better traction levels. The GT-1000 3 will receive the standard criticism of excess weight and tongue slide, both of which take off a few points off the GT’s total score. The shoe comes in heavy at 367 gms/12.9 Oz for a US 11, which makes it heavier than the Kayano 21 and even last year’s GT 1000. The extra weight is not going to make you lead footed, but that leaves another potential area open for advancement. Tongue slide is not a deal breaker, but Asics’ tenacious resistance to change is surprising. Why not put a small gusset or sleeve? If a new lining could be introduced in the GT-1000 3, a sleeve could very well make an entrance too. And if Asics does decide to do so, it will not be something new – mind you, just playing catch up with rest of the pack. All put together, the GT-1000 3 is $100 traditionalism, which feels very familiar to earlier GT’s, and yet sees a smattering of visible improvements (except weight). This is a shoe where stability and motion control are one and the same thing, and will be a potential buy for runners seeking a firm ride. Appreciate the detailed review. This is extremely helpful. I am a long term Asics runner. Started in 2002 with 1070s and kept going until 1170s in 2012. Perfect match for my feet. Weirdly the GT 1000 was a bad match. I’m a heavy tall, heavy runner and my complaint was the shoes felt seriously too stiff to run in. What would be my closest match to the 1170s which provided the best cushioning I ever experienced. (My spare 1170 stock supply will run out shortly.) Thanks. Not sure if this will help, but have you given the GT 2000 – 2 a try yet? More cushioned/softer than the GT 1000. Peter, my experience matches pretty much yours. I loved the 1170 which was the best running shoe i’ve had. The cushoning felt great, the laces system was really good as well. I had 6 pairs in 3 years now. Thanks for the feedback. I tried on some GT 2000 3 ‘s today. Maybe a small glimmer of hope. For heavy runners like myself this is less than ideal as there are unsatisfactory options for wide feet. Adidas – always too narrow. Mizzuno – never enough support. Brooks – not wide enough. I wish Asics would offer a cushioned range for weekend warriors who are never going to set records and are just happy to still be running pain free. Apparently Asics Gel Pursuit is a possible option, but I can’t find any on the web. Cheers. Appreciate the insights, will try and see if we can slot the Pursue for a review. Cheers. I believe there are a number of Asics users who are loyal to the product because of its cushioning and suitability to people with foot problems or wearing sports orthotics. To abruptly change without directing us to alternatives is hugely frustrating. I totally agree with Peter – to abruptly change the design and performance is not only frustrating but also dangerous someone could get hurt running on a completely different shoe. I tried the new GT 1000 Version 3 and they were a disaster – flat, hard, more set back and so a totally different running position – arch in a different place than the Version 2 – avoid the Version AT ALL COSTS!!! What an amazing site, never imagined such in depth reviews for running shoes. Anyone know, aside from color and the outsole, are the gt-1000 and gt-1000 gtx otherwise the same? Mostly wondering if they are each cut to an identical shape/fit. Thank you for the comment, Justin! 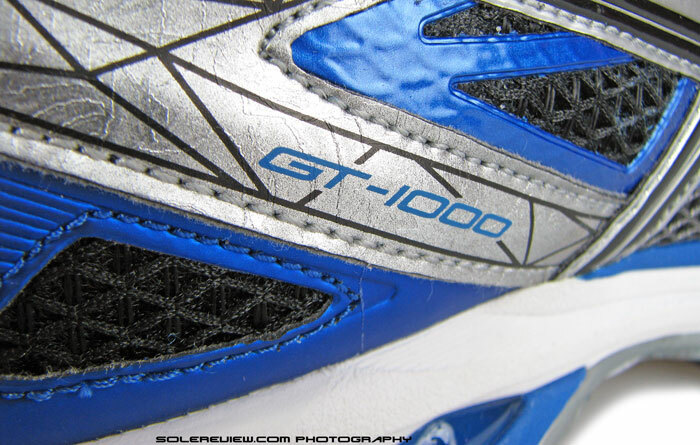 The GT-1000 3 and its GTX shoes are identical except for two aspects. One is the latter use of Gore-Tex lining which gives the shoe waterproofing. The second part is the fit, which should be slightly snugger on the GTX version due to use of a thicker inner lining. Great, exactly what I needed to know, thank you so much. Have to echo the other commenters: this is a great site. Your reviewers obviously know running. 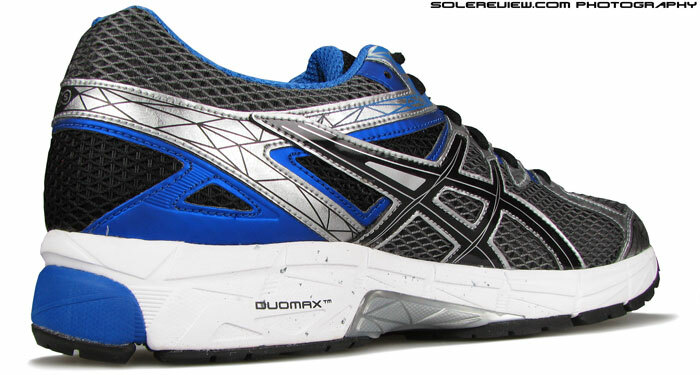 Quick question: I switched to the Gt-2000 series before Asics started making them lighter. I liked how the original gt-2040/50/60 controlled my heel and eased my footstrike back a little bit, so my foot landed more directly underneath my center of gravity. Injuries definitely were less common with those shoes. 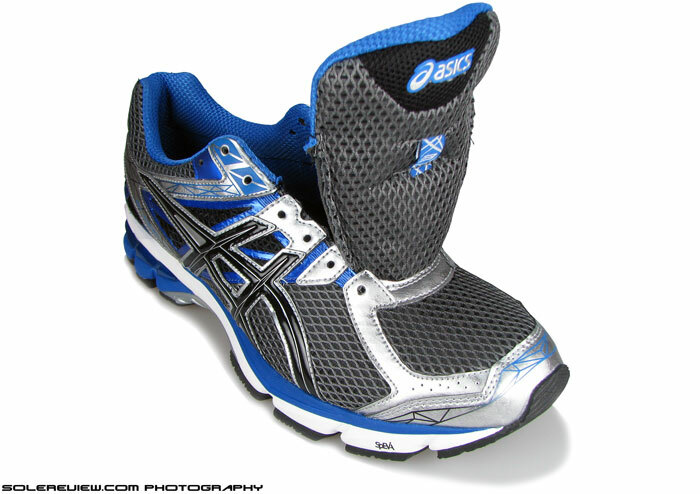 But the recent asics gt-2000 shoes don’t have the same structure, so I heel-strike more often. Would the gt-1000 be a better fit, based on what I liked about the gt-2040’s? Thank you for the question, Alex, we but we’re afraid we don’t have a solid answer to your question. We lack recent experience with the 2040, so don’t have a frame of reference to compare the fit or heelstrike pattern. All we can say that the GT-1000 3 does not seem conducive to moving the point of footstrike forward, as there isn’t much of a heel bevel – the angle which the outsole heel edge makes with the running surface. 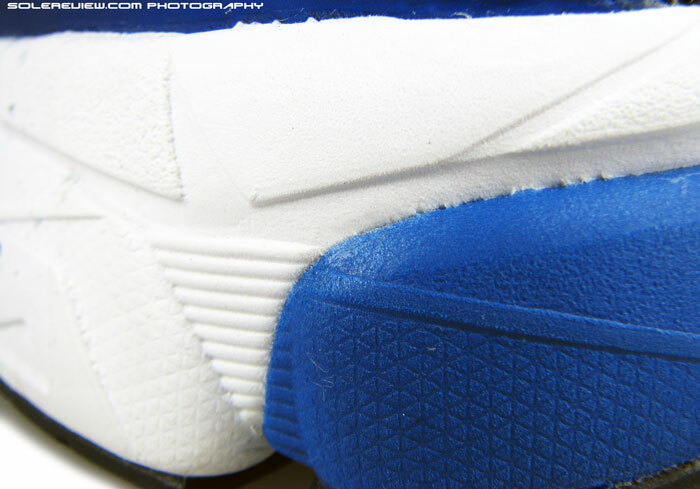 The GT-1000’s heel edge sits fairly flat and flush. Have read few reviews already about Asics as I was looking for a new Model lately to replace my Old Gel 1130 or Is it Gt Gel 1130… Since I love my Old Shoes and it’s my very first Asics as well. I wasn’t sure what to buy as a replacement… Decided to take the plunged and bought a New Pair of Asics GT 2000 v2 and to be Honest I find it too soft for my liking. I’m not sure if it’s because I wear a thin socks which makes my Feet slightly loose and the shoes was so light as well that I have to raise the speed of the treadmill just to get on with my Phase. My Question is: Is this the right Model to replace my Old Asics? Or is there any other models that You can recommend with the Asics brand? Hello Manny, the GT-1000 3 is the successor to the 1100 series, and notch firmer than the GT-2000 3, so this is something you should try. We really don’t have a wide range of testing experience with Asics apart from the Nimbus/Cumulus/Kayano/GT 1x, 2x, so for now the GT-1000 3 is what we can suggest. A lot of people say great things about the DS Trainer 20, but we haven’t reviewed that one yet. Thanks for the advice… I wonder what’s the difference between gt 1000 2 vs gt 1000 3 Asics… I hope I can find a store who can let me try on both models… leaving in Cheshire gives me very less options to find a store that supplies both Models… Big thanks again. Manny, you can read our review on the GT-1000 2 and 3 to understand the differences. Good luck with your purchase! Hi, I have flat foot and i need a comfortable pair of sports shoes which i can wear whole day at work (standing job). Will asics gt 1000 3 be a right one for me? Do you have a budget? The Nike Vomero 10 or Pegasus 32 feels right for this kind of thing.